Dubai World Trade Center was established in 1979 to act as a host to events and exhibitions in the UAE. The skyscraper was launched just 8 years after the 7 emirates had been united, giving it a historical significance to the UAE besides its huge financial contributions to the country’s economy. As the UAE always strives to provide its residents and foreign investors with an enhanced business environment, it has established a free zone within the DWTC complex to allow foreign investments a permanent representation in the UAE. The DWTC Authority Free Zone is considered a networking platform for businesses from around the world to grow their businesses in the UAE and the region. Since the UAE is the business hub for businesses in the Middle East, many international corporations constantly look to establish their presence in the UAE to have access to the region. Usually, foreign investors have two options when setting up their businesses in the UAE, namely Free Zone and Mainland business setup. Unlike Free Zones, establishing a business in the mainland allows investors to conduct their business throughout the UAE. However, full ownership of a business is not an option in Dubai DED. DWTC Authority: two in one? Dubai World Trade Center launched its Free Zone in 2015 to house foreign companies that are looking to expand their presence to the MENA region. Now it includes both Free Zone companies that are allowed to practice their activities within the premises of the WTC as well as the already established on-shore companies. DWTC Authority Free Zone stands out from other Free Zones in the UAE thanks to the benefits it offers. Besides the advantages that are common between all Free Zone – full ownership of a business, full repatriation of capital and profits and zero income and corporate taxes – DWTC Authority Free Zone provides its member other exclusive advantages. DWTC is located near Downtown Dubai and is 15 minutes away from Dubai International Airport. Individuals can also reach and have access to the venues easily from any point in Dubai or the UAE through the metro station. For companies that are already established in Dubai Mainland and would like to expand their operations within the Free Zone, they are allowed a special permit called the ‘Business Operating Permit’. This permit considers such companies licensed to purchase an office and conduct business within the Free Zone. However, for a company to granted this permit, the business activity to be practiced within the Free Zone should be in line with the one in the DED license. Otherwise, the company will be required to purchase a Free Zone license where it can conduct its new business activity. There are three main categories of business activities to choose from. Since the biggest events in the UAE and the GCC region are held in the WTC complex, other facilities and services should be available. Therefore, investing in trading and service activities is also available in addition to the activities on the events license. Subject to conditions stated by the Free Zone Authority, holders of DWTC Authority license and business operating permits are allowed to sub-lease the premises to other Free Zone members. The sub-lessor, however, stays liable for any defaults in payment made by the sub-lessee. The Free Zone Authority provides investors who have registered their businesses within DWTC Authority with all the services related to sponsoring employees and family members. The DWTC Authority Free Zone license and business operating permit allow their holders carrying out the business activity within the Free Zone. However, the Free Zone Department allows its members to distribute their goods outside the Free Zone by appointing a licensed distributor. The Free Zone Authority imposes no restrictions over the prices of the services and products. This means that the business owners have the freedom to set the pricing they deem best. Start your business DWTC Authority today and gain access to the gateway of regional and international opportunities. 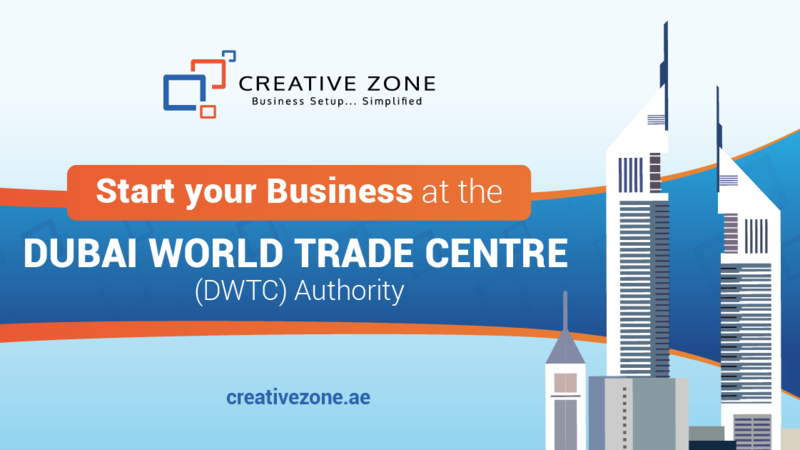 Contact CREATIVE ZONE to know more about setting up your company at DWTC Authority.